This is going to be the hardest in this short series. Why? Because the Chinese Army was one of the largest armies of the war, yet China had little industrial production. The Chinese imported most of their weapons, and because China was also dirt poor, most soldiers were poorly equipped and many had no weapons at all. What's more, China's shifting foreign benefactors also left the Chinese with a hodgepodge of foreign equipment from all over the world. What's more, compared to its scope the Chinese theater is the least documented of World War 2, at least in English. After 1933, the Kuomintang government of Chiang Kai-Shek received massive aid from Nazi Germany. The Germans did this to aid the Kuomintang in its fight against Chinese communists under Mao Zedong. 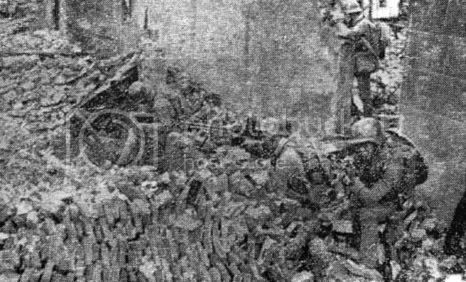 German military advisers trained Chinese troops, and Chinese forces received large amounts of German weapons and equipment. However, Germany was also building close ties with Japan. After the outbreak of the war with Japan in 1937, the Japanese brought pressure on the Germans to end their cooperation with China, which they did in 1938. In 1941, Germany recognized the puppet government of Wang Jingwei as the government of China. China struggled on without significant foreign aid until 1941. In April of that year, China was designated as an American Lend-Lease partner and began to receive military supplies from the United States. This would continue in various forms up to the present day American support for the government of Taiwan. This article deals only with the Chinese Nationalist Army. It does not cover Chinese Communist forces or Chinese resistance groups. Chiang Kai-Shek Rifle Type 1 Chiang Kai-Shek Rifle The most common Chinese rifle of the war was the Type 24 or Chiang Kai-Shek Rifle. The rifle was a copy of the German Mauser Gewehr 98 rifle. The rifle fired 7.92x57mm Mauser rounds from a 5-round magazine loaded by stripper clips. Production began at the Hanyang Arsenal in 1935. 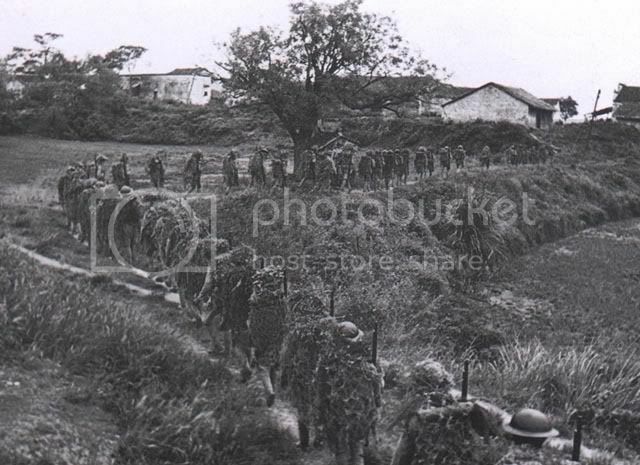 During the war, Japanese advances would cause production to be moved to Hunan. Around 500,000 to 600,000 Chiang Kai-Shek Rifles were built from 1935 to 1950. The rifle was superior to the Japanese Type 38 Arisaka rifle in both stopping power, range and rate of fire. The main drawbacks were weight (4kg) and varying quality of manufacture, with some guns being equal to a German Mauser and others being of lesser quality. The rifle came in two models. The above graphic pictures the Type 2 Rifle on top and the Type 1 on the bottom. They differed in the Type 2 having a shorter barrel and foregrip with a bent bolt action lever. 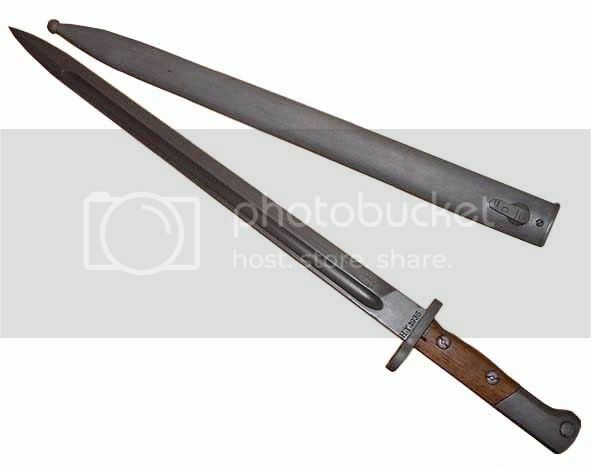 Both types could be fitted with the long HY 1935 bayonet. 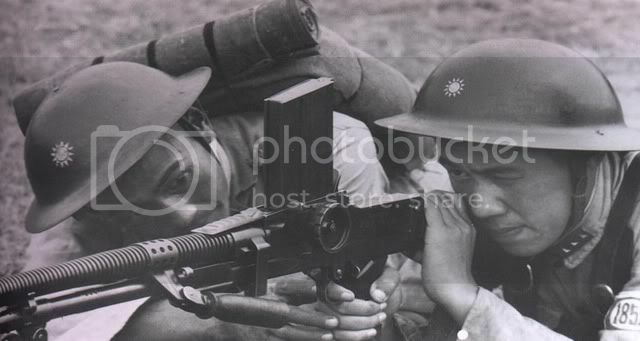 The Chiang Kai-Shek rifle could also be fitted with a scope for use by snipers. Sgt. Tun Chih Yeh made over 100 kills with the Chiang Kai-Shek Rifle. Chinese Sniper training. Officer on the left is holding some sort of sporting rifle. 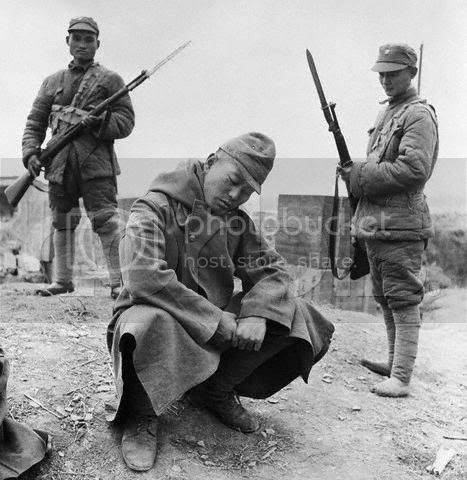 Chinese soldiers with Chiang Kai-Shek rifles guard a Japanese prisoner at Changde, winter 1943. 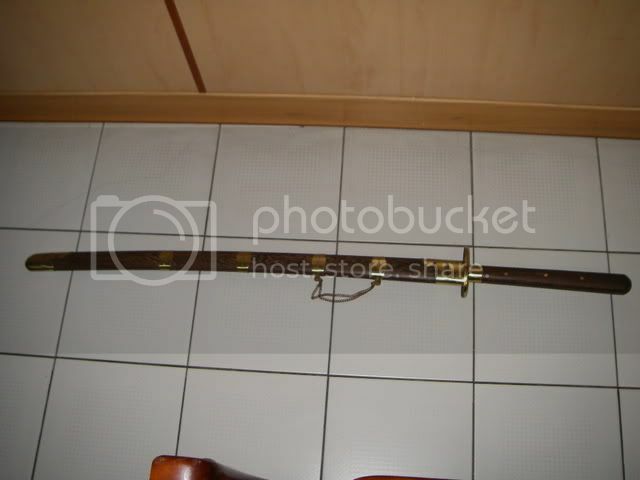 Hanyang 88 Rifle The Hanyang 88 rifle was a Chinese copy of the German Gewehr 1888 rifle. Also firing 7.92x57mm Mauser ammo from a 5 round magazine, the Hanyang 88 was considered a low quality weapon. Brno Vz.24 Rifle The Czech Brno Vz.24 rifle was supplied to Germany in large numbers, who in turn supplied it to China, where the Chinese manufactured local copies. Also fired 7.92x57mm Mauser. Karabiner K98 The Chinese received a number of German K98 rifles, especially in 1937-38 as the war with Japan began. 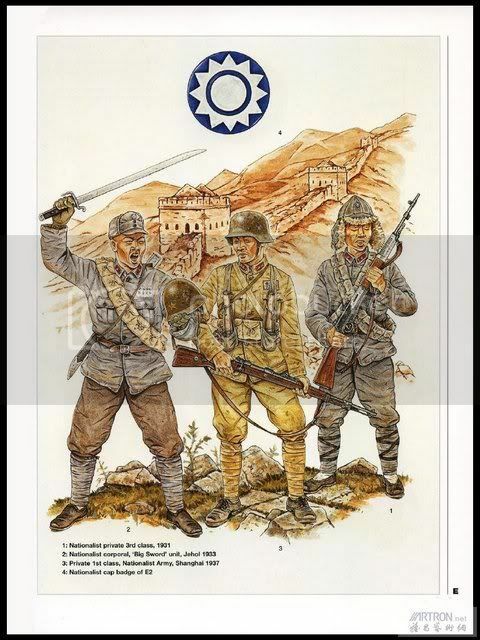 It was more common for German trained divisions such as the divisions used at Shanghai in 1937 to have authentic German equipment. Standard Model 1933 Carbine A copy of the German Mauser K98 rifle. More information and pictures of Chinese copies of German Mausers can be found in this online book. M1903 Springfield The Chinese received large stocks of American M1903 rifles after 1941. Enfield M1917 The Chinese also received a number of surplus Enfield rifles. 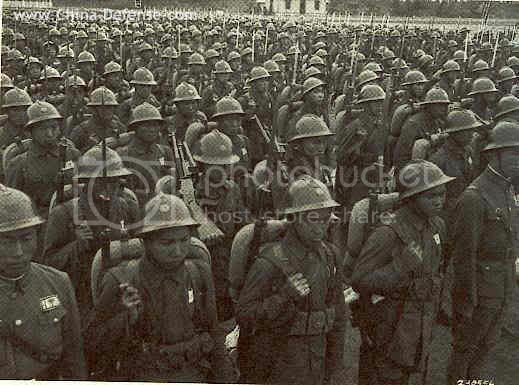 The most common occurence of American weapons was with the Chinese Army in Burma. 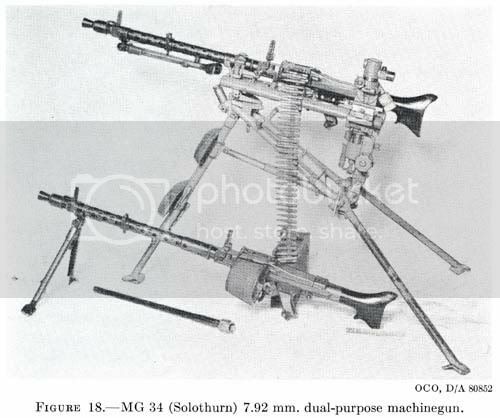 MP-18 SMG SMGs were very uncommon in the Chinese Army, however some MP-18 submachine guns were supplied by the Germans before 1938. M1 Thompson A few Thompsons were supplied by the United States under Lend-lease. These would most likely be found amongst Chinese forces in Burma, which were entirely equipped by Americans and led by American generals. A few copies of the gun were produced in Chinese factories as early as the 1920s. M3 Grease Gun Supplied through Lend Lease post 1944 in small numbers. The lack of submachine guns led the Chinese to turn to other solutions. 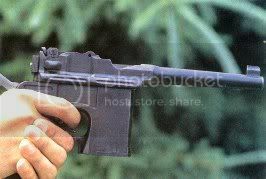 The German C96 Mauser automatic pistol was fitted with a wooden stock and issued to troops in large numbers as a submachine gun. Nicknamed the "box cannon", the gun was also produced in China. 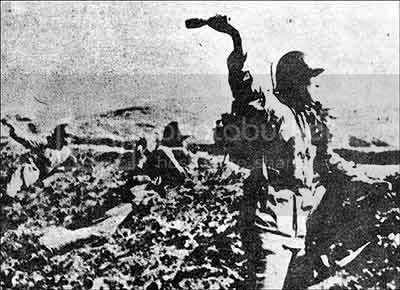 The gun was also popular with Chinese commando units. For a handgun, the C96 was extremely accurate (out to 200m) with a long range. It suffered from fast muzzle climb when fired on full auto. The C96 was chambered in 9x19mm parabellum or 7.63x25mm Mauser. The gun had an integral magazine usually holding 10 rounds, fed from stripper clips. Other models had detachable box magazines holding between 10-40 rounds. The Chinese produced local copies of the C96. 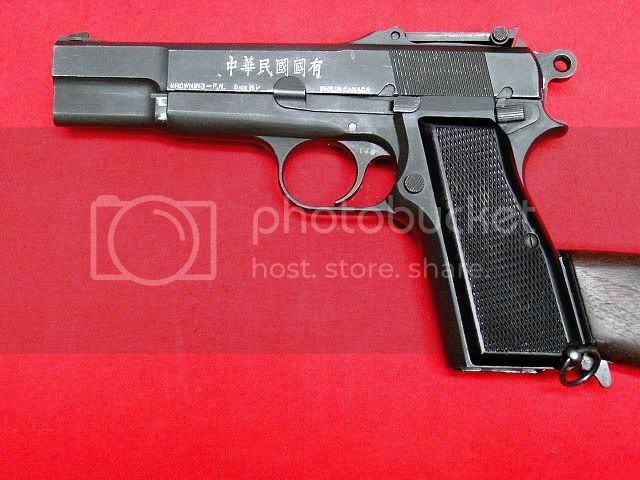 One variant unique to China is the Shansi .45, a version of the C96 chambered in .45cal. The Shansi gun also had a 10-round integral magazine loaded by stripper clips. ZB vz.26 LMG The Czech ZB.26 light machine gun was used in large numbers by Chinese troops throughout the war. Chambered in 7.92x57mm Mauser and fed from a 20 round magazine, it used the same ammunition as the Mauser family of rifles. 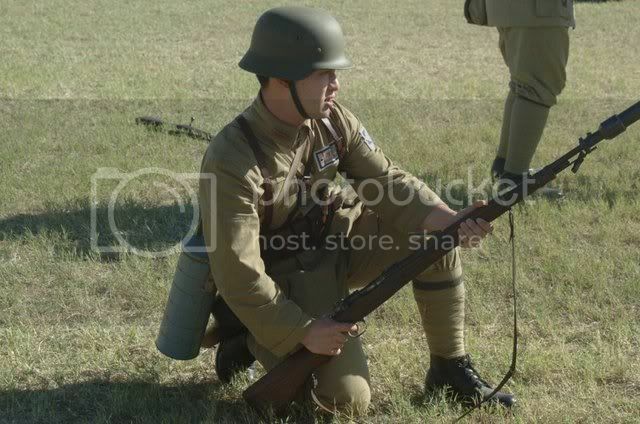 The gun was also the basis for the British Bren. Chinese soldier with ZB.26, Battle of Shanghai, 1937. MG-34 Light Machine Gun The Chinese received a number of MG-34s from Germany pre-1938, and these were used throughout the war and into the Chinese Civil War. The gun was copied by the Chinese and produced in Chinese factories. Browning M1917 Machine Gun M1917 Browning crew in action at the Battle of Wuhan, summer 1938. The Chinese had stocks of the M1917 received before Lend-Lease aid. Browning M1919 Also received post 1941 from American lend-lease. Type 24 Heavy Machine Gun The Type 24 was a Chinese copy of the British pre-World War 1 era Maxim gun. Browning High Power The Chinese were one of the first nations to adopt the Browning High Power 9mm pistol as a sidearm for officers. 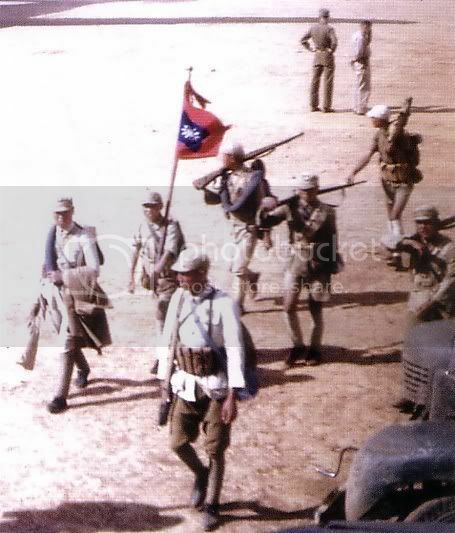 The gun was prinarily used by Chinese forces in Burma. Luger P08 The Chinese received a few Luger pistols from the Germans before 1938. Boys Rifle The Chinese received a few Boys Rifles from the western Allies. According to Wikipedia some were rechambered in .50cal BMG and used as sniper rifles. Stielhandgranate The Chinese received large numbers of German "potato masher" grenades and produced local copies. 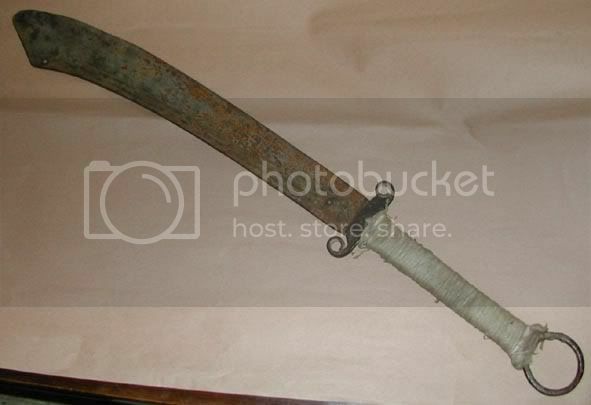 This was the standard Chinese hand grenade of the war. Famed for its role in the defense of the Great Wall, the feared Chinese heavy sword was a deadly weapon in close combat. 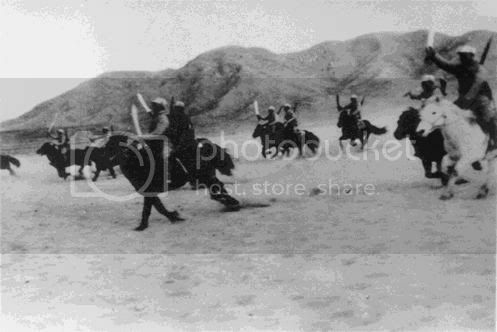 Chinese soldiers with Dadaos, 1933 Chinese cavalrymen with Dadaos Miao Dao Another type of Chinese sword. The Chinese Army had two uniforms, a summer and a winter uniform. The summer uniform was brown, and the winter uniform was a quilted gray-blue. Troops were issued ammunition pouches, a food bag, blanket, water canteen and gas mask. 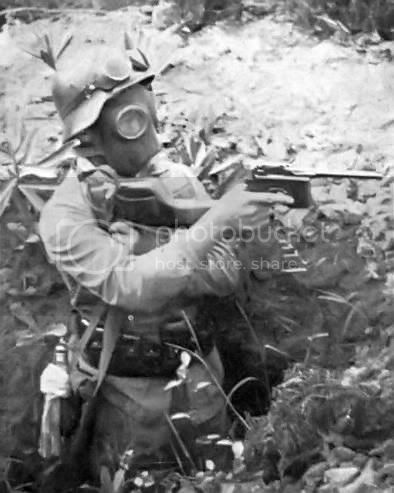 Unlike troops in many other theaters who viewed their gas mask as a useless piece of gear that only added weight, in China a gas mask was a necessity due to the use of chemical weapons by the Japanese. 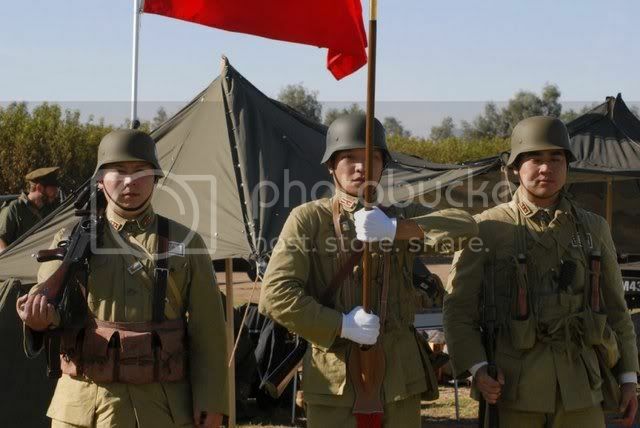 Rare color photo of Chinese troops on the march Modern day reenactors in Chinese summer uniform Chinese forces made extensive use of natural camouflage. Foliage was often stuck into helmets. Some units took things a step further and made smocks out of a net and interweaving leaves and branches into the net to produce a sort of ghillie suit. Helmets The Chinese used a wide variety of helmets during the war. 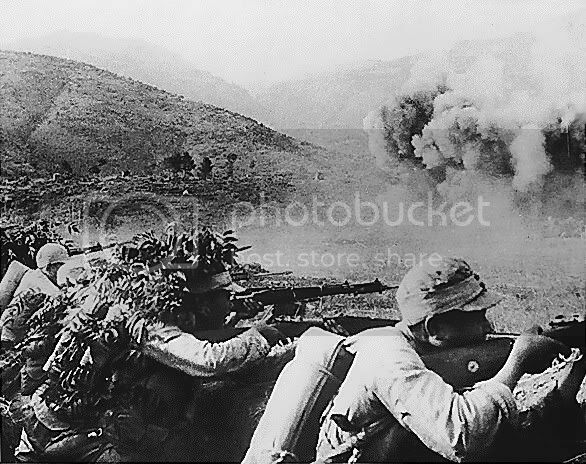 At the start of the war, the most numerous helmet was the German M35 Stahlhelm. 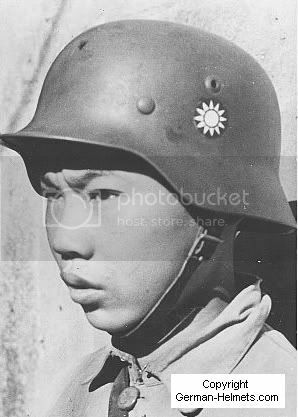 Each of these helmets had the Kuomintang 12-point star on the side instead of the Nazi emblems. Some units were equipped with the French Adrian helmets. Others had British Brodie helmets. 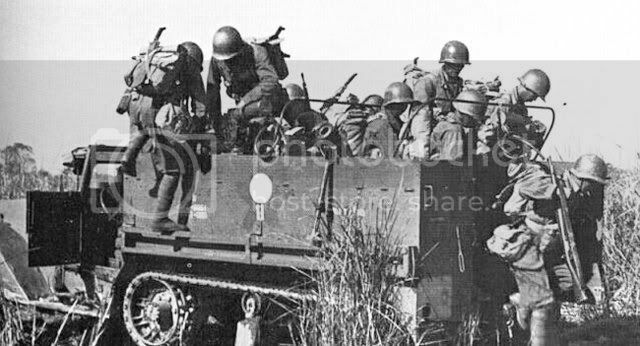 After 1941 some Chinese units received American M1 helmets. Once again, this would be most common in Burma. Chinese soldiers at the Salween River in Burma, June 1943. 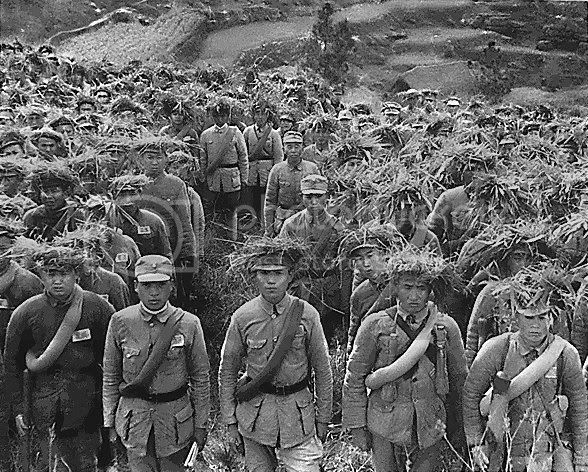 Many Chinese soldiers did not receive a helmet, and instead wore a sewn field cap. 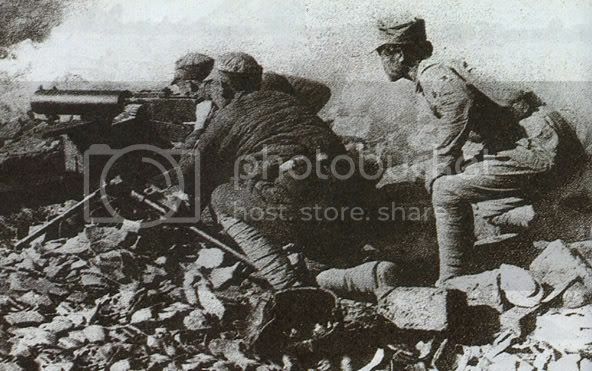 Mystery Weapon 2 Chinese soldiers using their machine gun as an antiaircraft weapon. What in the world is this gun? It looks like the side feeding (from the right!?) love child of a Browning Automatic Rifle and a Bren. 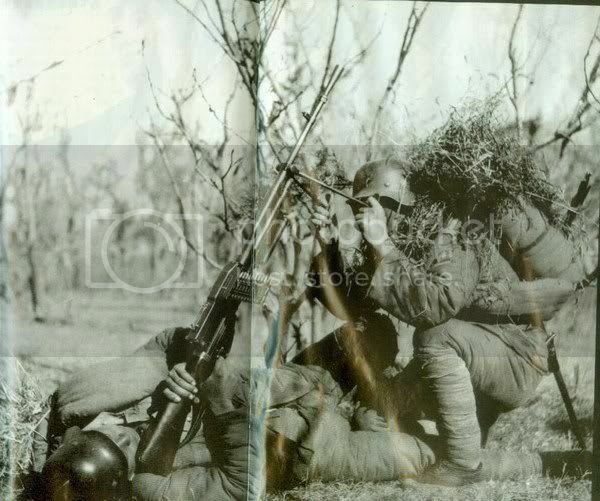 '[WDWMegaraptor;4748993'][/I]Mystery Weapon 2 Chinese soldiers using their machine gun as an antiaircraft weapon. What in the world is this gun? It looks like the side feeding (from the right!?) love child of a Browning Automatic Rifle and a Bren. Looks like some sort Italian Breda gun to me. Wow... THats pritty confusing. Put together by scraps of helmets, weapons, and equipment. Very interesting. I know very little about the Second Sino-Japanese war, or east Asian geography in general. I do know that the Chinese communists ran for the hills as a national redoubt, and that the Japanese had a difficult time cracking it.